So, what's the real deal with prepaid cell phones? Although I have a regular cell phone with a post-paid account I bought a prepaid cell phone to check out its pros and cons for myself. If you don't use many hundreds of minutes/month, a prepaid cell phone could definitely be less expensive. Like all telephone plans, it took some learning (and mistakes) - in the end I feel like I've become somewhat of a reluctant expert regarding Cingular's prepaid phone plans. I bought the cheapest phone I could find which cost $29.99 (plus tax). This plan included $10 of prepaid minutes (airtime). So, effectively, the phone cost $19.99. It's a basic phone with a simple color LCD, wall charger, and instructions. It also has basic services including SMS (not MMS) text messaging and the ability to lock the handset and SIM card. The phone can be purchased anonymously. For starters, you have to decide on which plan you want - you have two options. Do you want to pay 10¢/minute? If so, then you'll pay $1/day for each day you use the phone. Don't want to pay the $1/day fee? Just choose the other plan which charges a flat 25¢/minute. So which plan is for you? Simple, do you plan on using the phone for more than seven minutes per day on the days you'll be using it? If so, then choose the 10¢/min with the $1/day access fee. The next gotcha is the expiring minutes strategy. Since there aren't any monthly access fees for the phone company to charge you when you're not using the phone they have set an expiration date on the minutes you purchase. $10 expires after 30 days. $25-$75 expires in 90 days. $100 expires in 365 days. There's one saving grace: if you purchase additional minutes before your current minutes expire then your entire balance carries over. Here's a pain I'm currently enduring - I just changed the phone number on my prepaid cell phone. The rep in the store told me that it shouldn't cost anything to get the new number and it would be effective immediately. Within minutes my SIM card was updated, over-the-air, with the new phone number. The only problem was that the minutes didn't carry over, so the phone was effectively useless - I could neither make nor receive any phone calls - until I added more minutes. The store rep told me that it might take a few minutes, up to an hour, (or maybe 24 hours). I returned an hour later and, since it was Christmas Eve, he added $10 to the phone to get me through the rest of the day. Two days later and the minutes haven't carried over - the store reps working today told me that it might take up to five business days. Stay tuned. Updated 1/6/07 : I finally got the funds transferred to the new number. Dialing Customer Care was a waste - after three calls, over the course of a week, I gave up on them. A manager at the retail store was the way to go. He just gave me a prepaid card of equal value and we called it a day. If the WiFi network is open (no password required to join the network) then it should be legal to use it. If you have to break encryption to get connectivity then that should be illegal. Here's my reasoning via analogies. Even if someone leaves the front door to their house unlocked it is still illegal for strangers to enter because they would have to trespass without the owner's permission. This is why we lock our doors. If someone can see into your bedroom or bathroom window with the naked eye (pardon the pun) you would draw the shade for privacy since, like WiFi, it is something that can be accessed from a public street. Think of adding a password to your WiFi network and drawing the window shades both as privacy/security. 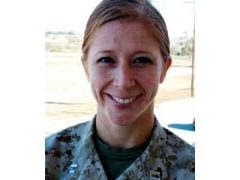 Major Megan M. McClung was killed in action in Iraq on 6 Dec 2006. Her service includes the distinction of being the first female graduate in the history of the Naval Academy (class of 1995) to have been killed in action and she's also the first female Marine officer killed in action in Iraq. She was hit by an IED on her way back from the Government Center in Ramadi after escorting Oliver North and his crew out to see the Marines. She was killed along with an Army captain and Army specialist. Megan had about a month left in her year long tour in Iraq. I was two years ahead of her at the Academy and I didn't know Megan personally - yet I certainly remember seeing her around the dorm and campus. 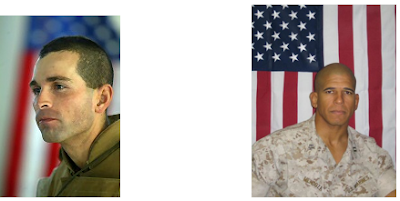 Since I've begun this blog only a few weeks ago, I feel that I should mention Rick Gannon (left) and Ray Mendoza (right) since they are two Marine officers I knew personally and served with at Second Battalion, First Marines (2/1). They were killed in action in Iraq on 17 Apr 2004 and 14 Nov 2005 respectively. I can't believe these two guys are no longer with us. "Tell your carrier's customer service representative that you're traveling abroad and want to use a foreign carrier's SIM card." "... say you've just bought a phone off of eBay and it turns out to be locked, or you want to use a phone locked to a foreign carrier, or you want to make a prepaid phone into postpaid – you have a bunch of different options." Basically, their advice is to make up any story in order to get your cell phone unlocked. Is PC Magazine really encouraging its readers to lie or is this just a stunt? Pretexting "is just lying" which lead to HP's problems in the boardroom. These comments by Sascha Segan are clearly stated with the intention to deceive. I've laid out my views on unethical behavior here. I've read some pretty iPod defensive articles on the Zune and I've read some pro Zune articles. It's easy to point your finger at the Zune and laugh - too easy since it's such a big target. Of course, we all laughed at Windows 1.0 in 1985, 18 months after the first Mac and two years after the Lisa (Lisa was the first commercial computer with a GUI). But, who was laughing when Windows 95 shipped? Obviously, the key for Apple is to make today's iPod obsolete with tomorrow's iPod and to keep putting distance between the iPod and Zune while learning from the Zune's successes and failures. If I understand net neutrality correctly, it means that all people and businesses get the same service if they pay the same price. Although this might be an oversimplification it seems that the best measure of service is bandwidth and uptime. Since most broadband downtime is unpredictable, let's just focus on bandwidth. If I want, say 1.5 Mbps up and downstream, I can purchase either DSL for about $120/month or a T-1 for about $400—$500 per month. Both advertise the same bandwidth, but, obviously, the T-1 is going to give me better service. Seems laissez-faire to me - the more I pay the better the service. What's the problem? A good metaphor for net neutrality would be USPS vs. UPS vs. FedEx. But, if you're telling me that two people can pay the same price for the same service and get different results, well, then, that's very different. Uptime has been great over the past four years. It's amazing how long some old hardware can last when you really stretch it out. There are a couple servers not in the photo and one of the servers pulls double duty. I started using Hamachi's VPN solution a few weeks ago and it's been great. It touts itself as "zero conf" which means it needs no configuration and you can just launch the client app and it magically works through firewalls. It runs on Windows, Mac OS X, and Linux. Simply start the app and create a network with any name (up to 64 characters) and it will create a network as long as one with that name isn't already created. Passwords can be unlimited length. 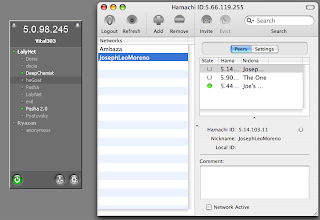 Anyone can launch the Hamachi client and join your network as long as they know your password. The brilliance in Hamachi is two fold. First is the fact that it assigns each client a unique "public" IP address that looks like this: 5.x.x.x. The beauty of IP addresses which begin with 5 is that the IANA has reserved the entire block of 16 million IPs. This means Hamachi's IP addresses are valid but never assigned making them semi-private. Most private IPs are used on home computer's behind a NAT router which usually look like 10.x.x.x, 172.16.x.x, or 192.168.x.x, or self-assigned IP addresses like 169.254.x.x. The other nice thing is that the Hamachi Root Server is only used to initiate a connection by helping clients find each other. Once the connection is made each client on your VPN passes its encrypted traffic directly to other clients on the same network. Anyone know how to deactivate a copy of Windows XP? Using Apple's Boot Camp beta I installed Windows XP - things seemed to go well so I activated Windows XP. Then I saw that the latest beta of Parallels (3036) can access the Boot Camp partition of Windows XP. 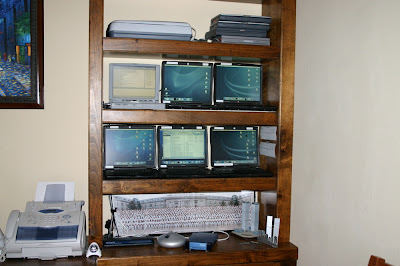 Parallels had to set up a separate configuration and profile of Windows XP in order to use the Boot Camp partition. It was working great, but I had to reactivate Windows XP. No problem there, however, when Parallels is accessing Windows XP on the Boot Camp partition the VM can't be saved - instead Windows XP has to be shut down when you exit Parallels. 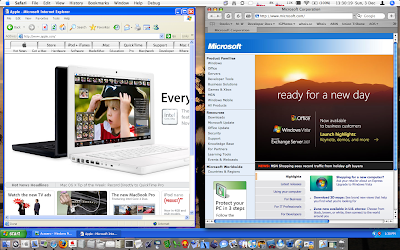 So, I created another Parallels VM and reinstalled Windows XP under Mac OS X. But, when it came time to activate this version it failed since I had just used the same key too many times. The last version I installed is great since the VM's state can be saved to disk and I don't have to wait for it to boot up. Obviously, the last version is the one I want to use. The new Coherence feature in Parallels is great. It makes it appear that Windows windows [sic] can run side-by-side with Mac OS X windows. I'm speculating here: but I'm thinking, to achieve this effect, Parallels simply has Windows XP run at almost full screen (the Taskbar is just above the Dock) and then it makes the Windows XP desktop window transparent. You can drag & drop and cut & paste between the two OS's too. Installing Windows XP via Parallels was simple and it worked like a charm. It's much easier to install Windows using Parallels than it is to install Windows natively on an Intel or AMD machine. Now I can fully enjoy Windows' pop-up windows on top of Windows' pop-up windows on top of pop-up balloons to constantly nag me.